A multifaceted author, American Amy Yoes’ work encompasses a variety of art-forms, such as installation, photography, video, painting, and sculpture, including public sculpture. Her interest in decorative language and architectural space is channelled through the most varied site-specific pieces made along the years. She has been represented in a number of solo and group exhibitions both in the United States and Europe, Portugal included. Although Yoes’ recent production is strongly connected with the latest forms of artistic expression, it is also deeply rooted in the European iconographic tradition. 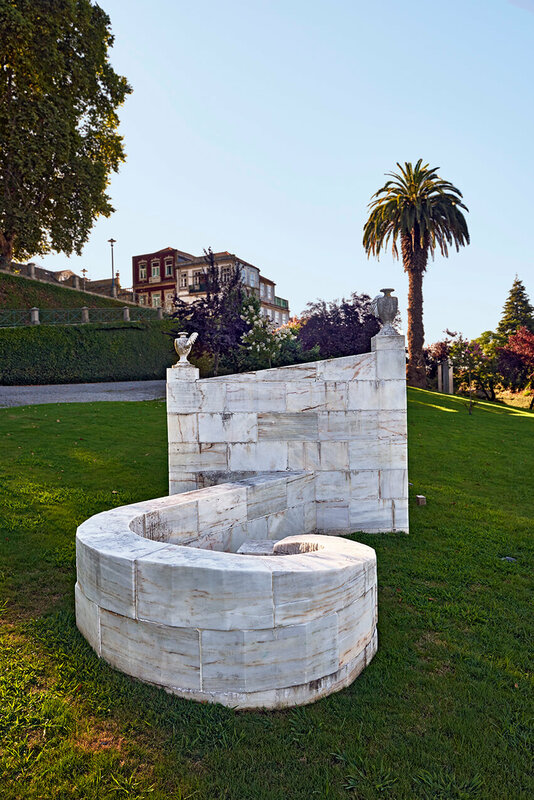 Thus, the sculpture designed for the 2nd Santo Tirso International Symposium of Contemporary Sculpture shows a low wall of elliptical shape ending in two open volutes, and topped by two asymmetrical, winged classical amphorae. The characteristic white and pink colours of Alentejo marble intensify the round, gentle shapes which, along with the prominently placed amphorae, pungently point to the classical world, the Roman house and its ornamentation, as well as contribute to ascribe this piece to postmodernist aesthetics, as it reads the past from a modern perspective, reconfiguring its presence through the use of paradigmatic symbols of its visual history. Capriccio also provides an architectural experience of sculpture — the alternating open and closed spaces, in a clear allusion to the inside/outside dialectics, suggest a primordial house, an intimate, affectionate and transcendent space, ornamented by winged vessels that may carry and store sacred substances like water, wine, oil, honey, seeds or cereal.